Apple's gradually increasing focus on the health and wellbeing of its users has been encouraged under the tenure of CEO Tim Cook, who has previously expressed hope the iPhone producer will be remembered in the future for its contributions to health than technology. While Cook may be trying to make health "Apple's greatest contribution to mankind," it may also be a prime opportunity for the company to earn more revenue from its existing and rumored future devices. According to Loup Ventures analyst Gene Munster, Apple's ambitions to enter the healthcare market is "not currently priced into shares" yet. 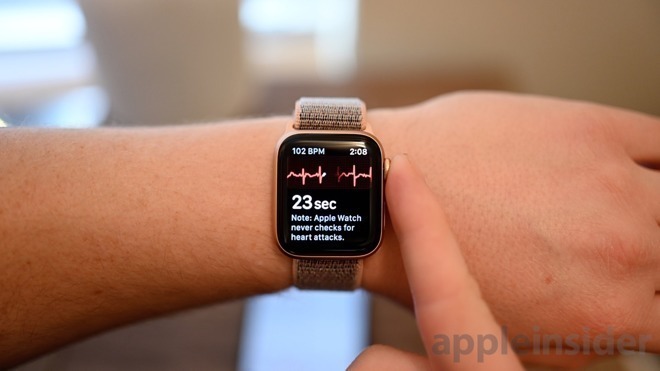 Apple is thought by the analyst to "pursue a path toward improving primary healthcare by leveraging wearables, AI, and their user-centric software to connect consumers, providers, and payers." It is reckoned healthcare accounts for 18 percent of the US gross domestic product, but despite the size, technology hasn't had much of an impact on the industry. A number of factors limits its impact, Munster claims, with "how we pay" for healthcare a prime reason followed by FDA approval hurdles and the use of legacy technology for infrastructure. The payment element is what Munster believes is Apple's key to becoming widely used across the industry, by aligning itself with "the incentives of payers and providers." While payers, such as private insurers and the government, have an incentive to save money, this doesn't give much opportunity for Apple's consumer-focused approach to come into play, due to the separation of payers and patients. As physicians and providers bridge the gap between payers and patients, it is likely they are the biggest target for Apple's healthcare moves, as they have the ability to influence patients. "The question is, can tech enhance or foster that relationship to be more regular and more productive?" Munster asks. The financial incentives have slowly shifted towards providers in the last 15 years, with physicians taking the financial risk of care. As a physician is paid per month for the total care for a patient rather than on a per-event basis, this leads to physician and provider profits to increase if they can get patients to be healthier, making them prime candidates for life-affecting technological changes. Minster believes there are two approaches to this, with the obvious being the addition of more health-monitoring elements to its devices. The Apple Watch and "eventually AirPods" could add other biomarkers such as blood pressure and hydration to its existing roster of fitness metrics, with the market primed to continue growing. "The wearables segment represents a measurable revenue opportunity given its small today and foundational to Apple's healthcare master plan," Munster believes, with wearables accounting for 5 percent of current sales with expectations for it to grow to 8 percent in five years. Based on Apple Watch sales of 67 million since its initial release and estimates that 85 percent of units are still in use, it is suggested there is an active install base of 57 million Apple Watches. With an active iPhone base thought to be over 900 million, it is proposed the Watch business could eventually be 15 times bigger if widely adopted by iPhone users, but more realistically could be four times the size than at present. While AirPods are rumored to have health tracking functions added in a future revision, Munster believes the features are "likely years away," though highlights how the inner ear is an attractive location for monitoring a user's health, as well as Apple's patents on the subject. Munster's other suggested approach is for Apple to take advantage of all of the data it is collecting from the Apple Watch and offer it to healthcare providers. Harvesting data, then filtering and analyzing it on behalf of providers would offer data that could be used to better treat the patient, most likely at a far lower cost than the physician or provider would pay to gather the information itself. "The offering would likely start with the consumer paying about $300 for a Watch that captures heart rate, activity, sleep, temperature, blood pressure and makes the data actionable," muses Munster, continuing by proposing "the physician would pay Apple a per-month per-user fee." The proposed cost to physicians would be $10 per patient per month, which would be quite a small cut from the monthly profit they would usually make, but given it would provide access to many hours of organized and analyzed data of the patent's living habits, it could be a relative pittance to pay compared to the potential benefits. Apple's existing work in healthcare has made some progress, with its Health Records platform for sharing personal health data between patients and caregivers receiving very favorable reviews from its early users. Apple's policies to minimize data collection in favor of user privacy is also thought to be a benefit for healthcare, with Cook suggesting at the end of February "People will look at this and feel that they can trust Apple," a key item for firms working in the health space. The company also counts at least 50 medical doctors on staff throughout the company, working to extend the health technologies already offered in its products, as well as updated versions. I'm really skeptical of Apple selling health data. Not selling persay, you have a watch. With all that valuable data and you want to share it with your doctor . If would cost your doctor $10 to directly obtain that data from Apple. Or your doctor would pay $10 to Apple and request you provide that info to him to maintain your health. Thats how I perceive it would happen. Apple is too big a company to just sell its data. If would set up a patient approval process. How about Google or Facebook? Not skeptical I guess. The article reads like it will provide data on a per customer basis not in mass. After consent, the data will most likely only be shared with doctors. I wouldn't take anything Munster says seriously - the guy is an analyst-wannabe. Just that one statement "take all the data it [Apple] is collecting from the Watch" shows how little he understands reality. Apple isn't collecting that information! A customer's *phone* is collecting that information from he Watch. Apple doesn't have access to it! I can't see what you're suggesting happening. Apple has actively promoted that you'll, eventually, be able to share your health records with your healthcare provider as you see fit. No cost to anyone involved in that sharing. But I can see Apple selling the doctors and/or hospitals the software (perhaps on a subscription basis) to facilitate this sharing. Doesn't say anything in the article about selling health data. ... As a physician is paid per month for the total care for a patient rather than on a per-event basis, this leads to physician and provider profits to increase if they can get patients to be healthier, making them prime candidates for life-affecting technological changes. It is based on the assumption that paying physicians a lump sum to promote health versus treating disease will generate income for them. It won't. First, most physicians are employed or controlled by large provider organizations, they are not the independent, standalone entities we tend to think of. Second, the large healthcare provider organizations who control them and manage them are far more concerned with their profit than they are of your health. Third, the proposed lump sum payment actually encourages profit taking more than health promotion because it incentivizes the provider to work to increase their revenue while decreasing their services and cost. As a Home Health nurse, the agency I worked for was paid a flat fee to provide care for each patient for 9 weeks. The flat fee was determined by the patient's condition: a patient with diabetes, heart failure and pressure ulcers generated about $5,000 while a more healthy patient only about $2,000 for the 9 weeks. But the agency engaged in what Medicare calls "Gaming the system". Their executives went to seminars where they were taught how to do it without getting caught and then came back and relayed the information to their nurses in mandatory monthly "employee meetings". There, we were taught how to increase diagnosis and revenue without getting caught ("Look for redness on an elbow or wrist -- it can be diagnosed as a Stage 1 pressure sore which gets us more money"). But then, in addition, visits to the patient were curtailed -- often to the required minimum of only 5 visits for the entire 9 week process. I think it is highly unlikely that these major healthcare providers will spend time, energy and money building the systems to deal with input from Apple Watch's when they can make far more money with far less effort by simply "gaming the system". While some may consider me overly cynical, my experience inside the system, tells me it is not cynicism but reality.